The B1 sCVD Diamond Detector is typically used for single-particle detection. It has a compact design with extra RF shielding and is completely RF tight. The B1 sCVD Diamond Detector can be operated in vacuum as well as at cryogenic temperatures. The detector is read out from the high-voltage side. 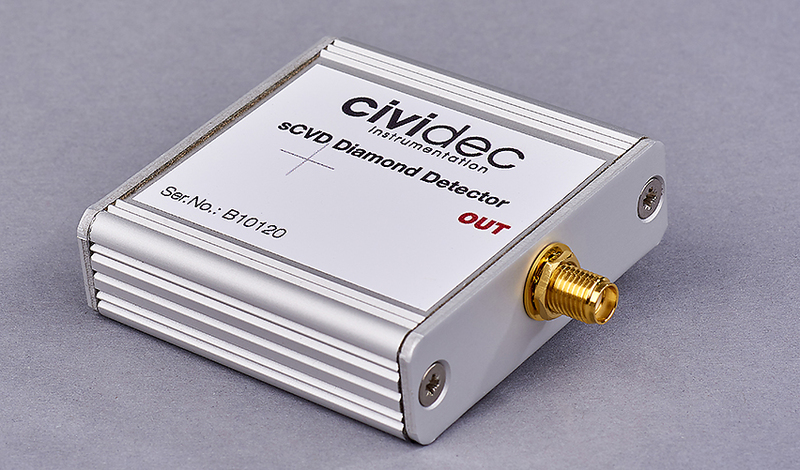 The sCVD Diamond Detector is ideal for single-particle detection and identification. TCT Measurements: In combination with the C2 – TCT Broadband Amplifier it is optimized for TCT measurements and general detector physics. With this system direct measurements of the detector current is possible and therefore pulse shape analysis. Fast & Low-noise Measurements: In combination with the C6 Fast Charge Amplifier fast single particle measurements with an excellent signal-to-noise ratio of 20 for MIP particles and fast particle counting up to 50 MHz is feasible. Precision Spectroscopy: In combination with the Cx Spectroscopic Shaping Amplifier the system is dedicated for precision spectroscopy with a counting rate of 1 MHz. The advantage of this system is that the noise level is extremely low. Vacuum and Cryogenic Environments: In combination with the Cx-L Spectroscopic Amplifier a 2 m long cable can be used between detector and amplifier, where MIP particles can still be detected with a stable SNR.